Home>News of Metal Industry > Will China’s new 5 year plan reform its stainless steel industry? 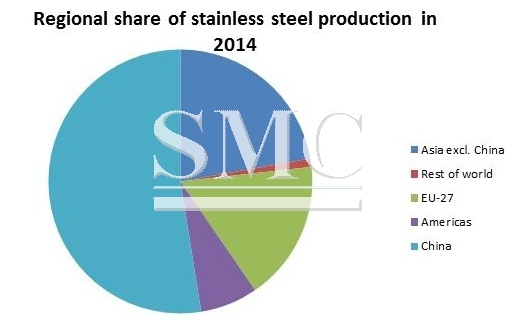 Will China’s new 5 year plan reform its stainless steel industry? In March the National People's Congress adopted China’s new five-year plan for the economy, aiming for 6.5-7% growth a year by 2020. Many of the measures announced by China's Premier Li Keqiang were aimed at cutting high debt, streamlining state-owned enterprises, and reforming financial markets, the BBC reported. This will inevitably include a shake-up for the country’s ailing steel industry. China’s economy is beset by slower growth and market volatility. At his annual press conference after announcing the new plan, Mr Li stressed the importance of reforms to economic vitality. He also acknowledged there would be job losses as state-owned enterprises are reformed, particularly in the steel and coal industries, but said there would be no mass redundancies. The Economist remained sceptical in its reports, suggesting that the government would struggle to meet its targets without providing more stimulus to the national economy. China's economy experienced its slowest rate of growth for 26 years in 2015, and its stainless steel industry continues to suffer from massive production over-capacity. Sever under-utilization of installed capacity has led to reduced economic efficiency for many enterprises. Professor Song, Head of the Stainless Steel & CRA Research Department, explained that it’s not all bad news: two hotspots are the civil nuclear and LNG industries. “Material consumption within the nuclear power generation industry is massive,” he explained, while also pointing out the construction of stainless steel tanks for the LNG industry is a growing market. Professor Song will give an in-depth plenary presentation on the development of Chinese duplex stainless steel in recent years and its current status at Duplex World Seminar & Summit, which takes place 12 & 13 October 2016 in Düsseldorf, Germany. He will be available to speak to delegates and visitors and provide valuable insights into the Chinese market.